Tonight I'm having a few people around to drink some whisky. I did it about a year ago and it was heaps of fun. 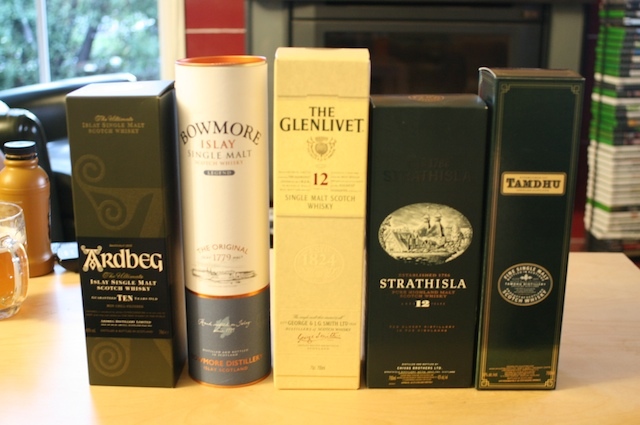 Basically what happens is that I buy a bunch of single malt whiskies, print out some tasting notes from Michael Jackson's excellent Malt Whisky Companion, and then we all taste the whiskies one by one, without knowing what we are tasting. Over the night, everyone votes for which whisky they think is which, and then at the end of the night, the person with the most correct wins! I think that the difference between the Islays and the Speysides will be pretty obvious. There will also be a sixth, surprise whisky from a location with a similar climate to Scotland, but is much closer. Can you guess what it is? You forgot to mention one of the highlights – the demonstration of the whisky metabolising machine (called ‘Maurice’).